This is part 3 of the School Branding series. You can find Part 1 here and Part 2 here. We want our school to be more than just a place where kids go for most of the day. We want our school to serve as a symbol of pride for the community, our parents, teachers and students. This takes work on our part. After reading Michael Hyatt’s book, Platform, I wanted to connect the concepts of building a successful business brand to what we do in education. One of the concepts had to do with promoting or sharing a company’s vision. I recently wrote a post about Preaching Your Vision, and the ideas are similar to the ones I share here. When trying to create a loyal following, the WHY is more important than the WHAT. In Simon Sinek’s book, Starts with Why, he describes how Apple has done a great job of sharing WHY they do what they do, and that has created a loyal group of followers who connect with that WHY. Apple users will wait in line for hours just to get the newest iPhone, even though if they wait a couple of weeks, they can get it without the wait. Loyal Apple users proudly add little Apple logo stickers to the back windows of their cars. Wouldn’t it be great if our parents would show off our school logo on the back of their cars – even if their child wasn’t an Honors Student? How do we get this kind of loyalty? What successful companies, like Apple, do is share the WHY, and they share it as often as they can. When people connect with the WHY, the are more excited about buying their WHAT – the product. WHY do we exist as a school? Do we even know? Do our parents know? Do our teachers know? Do our students know? We all have vision statements. They talk about rigorous education and preparation for success, etc. How often do we share that vision statement? Do our teachers even know it? 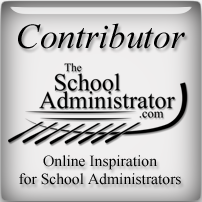 Who created the vision statement for your school? Was it created years ago, and forgotten? Is it time to create a new one? Your vision statement should explain your WHY. It should clearly describe WHY your school exists. But, creating a vision statement is only the first part of creating a loyal following for your school. Now it falls on us, the school administration, to make sure that our vision statement is communicated to our parents, teachers, students, and anybody else who is connected with our school. This is what successful companies with loyal followers do. It’s part of their branding strategy, and it needs to be part of our strategy as well. We do work that matters. We are educating the leaders of the future. Let’s make sure that people know this. How would YOU answer the question: What is your school all about?